Happy Summer Ya’ll. I don’t know about where you are from, which I can guess is probably Southern Ontario or Calgary, but it has been cold as hell around here for far to long. But, the winter has broken and now I am sitting drinking strawberry lemonade with tequila and sitting directly in front of a fan. I’m in a new apartment and have some other new things going on. Why not start back up with a recipe that really took me by surprise how delicious it is. 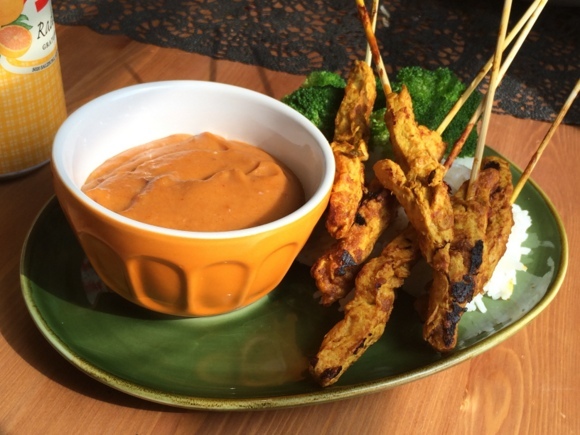 Chicken satay with peanut sauce was a favourite dinner party appetizer and summer BBQ staple in my family. And I think we can all agree that there are few things more delicious than peanut sauce. I could seriously eat it with a spoon. The marinade is really the trick here and it is inspired by a few different recipes from around the web. Give it a go! Mix all of the marinade ingredients in a bowl big enough to hold the chicken strips. Whisk until well combined. Pour the chicken strips in to the bowl and make sure they are well covered by the marinade. Put the bowl in the fridge and let the chicken strips marinade for 2 hours. In the meantime, put all of the dipping sauce ingredients in a medium saucepan. Let it come to a slow boil over medium heat and whisk continuously. The sauce will begin to thicken after about 5 minutes. Continue to whisk the sauce until it is the consistency you want. I like it to be a bit like pudding. (That is a weird reference). After the chicken has finished marinating, gently run bamboo skewers through the strips. The vegan chicken strips don’t hold up quite as well as real chicken when you skewer them but it is doable. Unfortunately for me, I don’t have a BBQ at my new apartment but as an alternative, I do have a George Forman grill, so it will have to do. Grill the chicken skewers until browned. Now let me tell you, these are way WAY more delicious than I ever could have expected. Seriously. I served them with a side of white rice, steamed broccoli and of course the peanut dipping sauce.